The free Dash Shuttle with a stop just outside our hotel transports you to downtown Olympia every 15 minutes on weekdays from 7am - 6pm. 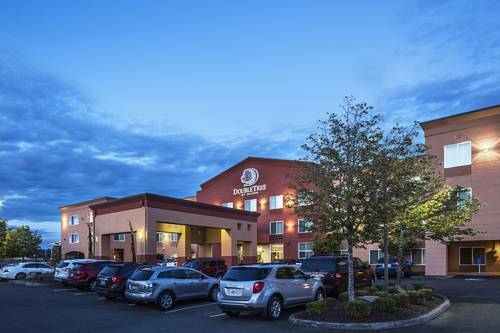 Set just off I-5 in Downtown Olympia Washington the DoubleTree by Hilton Hotel Olympia offers spacious accommodations fantastic business and leisure amenities and a prime location just minutes from shopping dining and leisure options. This Olympia WA hotel also offers easy access to the State Capitol Building and Museum and Capitol Lake. Take the family for a fun day out at the Hands On Children*s Museum explore the eclectic shops cafes and restaurants of Downtown Olympia and discover the Farmer*s Market at Percival Landing one of Olympia*s many waterfront parks. This modern hotel in Olympia WA offers a 24-hour business center the latest A/V technology two conference rooms and a board room making it ideal for successful business or social events. From spacious comfortable guest rooms to elegant suites this Downtown Olympia hotel offers a choice of stylish accommodations. all equipped with complimentary WiFi a 40-inch LCD TV a spacious executive desk a mini-refrigerator a microwave and plush beds. Energize after a busy day exploring Washington State with a workout in the complimentary 24-hour Fitness Center featuring the latest equipment. Refresh with a dip in the indoor saltwater swimming pool or the soothing waters of the whirlpool. Enjoy American and international dishes in the relaxed atmosphere of Press NW Bistro - Bar. Our friendly staff look forward to welcoming you at check-in with a warm chocolate chip cookie. Reservations must be cancelled 24 hours prior to local time of arrival to avoid penalty. Early Departure - No fee if check out by noon. After 2PM, a half-day rate is charged. - Lacey Hawks Prairie Business Distr.